To impersonate as any HTTPS-protected website and spy on when banking or shopping online. The rogue certificate, dubbed eDellRoot, was first discovered over the weekend by a software programmer named Joe Nord. The certificate is so creepy that it automatically re-installs itself even when removed from the Windows operating system. The self-signed transport layer security (TLS) credential came pre-installed as a root certificate on Dell PCs and laptops that are signed with the same private cryptographic key, which is stored locally. That means an attacker with moderate technical skills can extract the key and abuse it to sign forged version of TLS certificates for any HTTPS-protected site on the Internet, exposing users to all manner of SSL attacks. The certificate key can be used to conduct man-in-the-middle (MITM) attacks on Dell owners, silently stealing user names, passwords, session cookies, and other sensitive information when the affected Dell machines are connected to a malicious Wi-Fi hotspots in cafes, hospitals or airports. The problem is similar to the scandal that hit Lenovo in February when the PC manufacturer was caught pre-installing an invasive adware program called Superfish with a similar self-signed cert to inject third-party advertisements into websites on browsers. 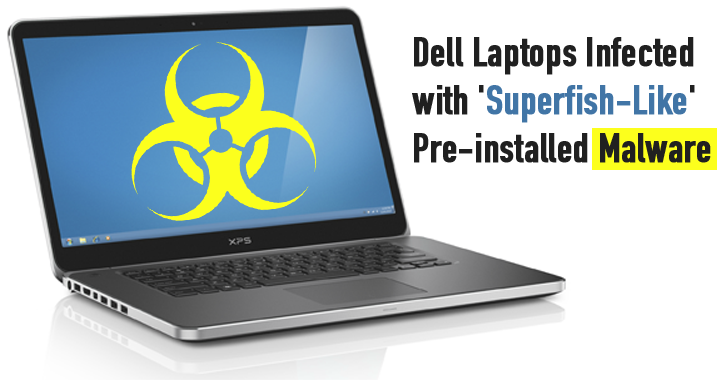 Although Dell’s case is different as there is no indication that the certificate is being used to inject advertisements on the laptops, the resulting security issue is the same. This indicates that the dangerous certificate may be present on a significant number of the Dell desktops and laptops currently on the market, specifically recent Dell Inspiron Desktop, XPS, and Precision M4800and Latitude models. Once found, right-click over eDellRoot and hit “Remove.” It appears to be gone, but actually it’s not. Reboot your computer and reopen certmgr.msc and search for the certificate “eDellRoot“. Yeah, the removed root CA cert is back. What Should You do? How to Remove? It seems that even if the certificate is clearly fraudulent, Google Chrome and Microsoft Edge and Internet Explorer browsers always establish an encrypted Web session with no warnings. But fortunately, Mozilla’s Firefox web browser generates an alert warning that the certificate was not trusted. So, Dell customers with new XPS, Precision, and Inspiron models are advised to use Firefox to browse the web. To fix the issue completely, Dell users will need to manually revoke the certificate permissions, which is a complex and technically demanding task. Moreover, security researcher Darren Kemp from Duo Security says that the problem may be even worse than what Nord suggested. In a statement, a Dell spokesperson said the company is investigating the report and looking into the certificate, but emphasized the company’s policy of minimizing pre-loaded software for security reasons.